USD has switched to single-stream recycling over the summer and is looking at expanding the current recycling program. The university started a pilot recycling program in 2016 and has been taking baby steps towards a campus-wide program since then. The most recent advancement has been changing waste collection companies. Instead of a multi-stream system, where every type of recyclable needs to be sorted out by university employees, USD has switched to a single-stream system with Waste Management. Scott Pohlson, the Chair of the President’s Committee on Sustainability said switching to Waste Management has many perks. Right now the system runs off of student workers. 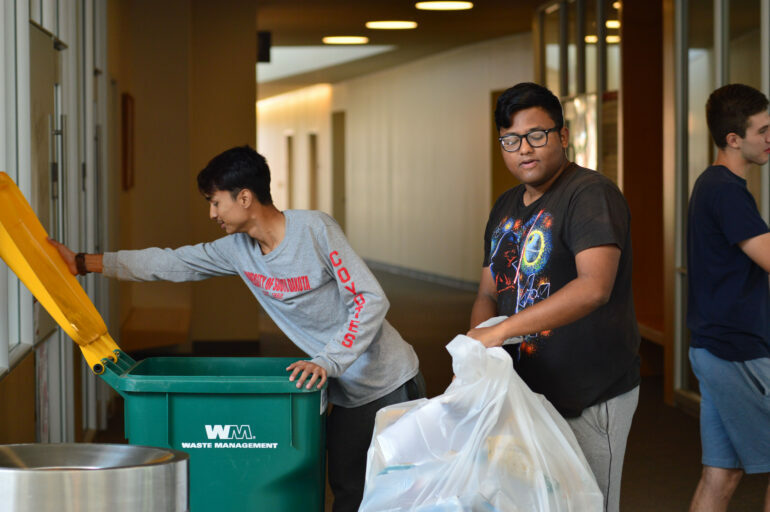 Hadi Hindieh, a sophomore human resources major, and Ritesh Ray, a second-semester biology major have been working on recycling with Pohlson throughout the summer. Ray said the new system has cut down on the hours it takes to collect all the recycling. “On an average day we used to work for like three hours now it has been reduced to two hours,” Ray said. Currently, the recycling program has been implemented in Delzell, Slagle Hall, Belbas, the Law School, The Munster University Center, the DakotaDome and the Sanford Coyote Sports Center. However, the program will start to expand with the time saved from switching to a single stream system, Pohlson said. Pohlson said the new system allows for more items to be recycled as well. One challenge with the recycling program, in general, has been figuring out how to explain the program to the USD community. “We do have signage but we are still trying to figure out the communication piece of it,” Pohlson said. Once the program starts to spread to more locations on campus Pohlson said the committee will start to look at diversion techniques. “The straw thing with Starbucks is a big deal, while that’s kind of kicked off into something where Aramark says ‘hey, we can make straws optional.’ so that’s one of the things we are going to talk about is like a Chic-Fil-A is asking if someone wants straws or just putting staws out and letting people use them if they want to,” he said. Hindieh said one solution could even be as simple as giving every student a metal USD straw. Pohlson added that his favorite part about the way the program has evolved has been getting to brainstorm solutions with students that are passionate about recycling. “The best thing about this is getting to work with student workers. That’s the cool part about this program is the workers are doing it because they have a passion for it,” he said.